Mechanicsburg, PA — (July 15, 2016) — Lance Dewease served notice he is as ready now as he was in May for the impending invasion by the World of Outlaws sprint cars at Williams Grove Speedway on Friday night by claiming another tune up event just one week before the outlaws hit town for the Summer Nationals. In May, Dewease won the tune up and returned a week later to thwart the outlaws at the Grove and he’s now set to defend the local turf again after his flag to flag performance on Friday night to record a $4,000 payday, the 85th victory of his career at the oval. In the 358 sprint main, Doug Hammaker came forwart from 10th starting spot to claim his first victory of the season at the track. Dewease earned the pole for the start of the 25-lap sprint car feature and was never tested for the victory. The Fayetteville flyer took off when the green flag dropped with second starter Stevie Smith in tow. The leaders hit the backmarkers on the sixth tour and Dewease moved freely around the speedway to work the traffic including an electric move on the 11th tour when he blasted right between Frankie Herr and Joe Trenca upon entering the third turn while never skipping a beat with his thread-the-needle move. The races only caution flag unfurled with 11 laps to go, wiping out a 2.6 second lead built by Dewease over Smith. Smith tried to stay close to Dewease on the restart but the six-time track champion steadily pulled away lap after lap to run to the win, taking the checkers by 1.4 seconds while working traffic. 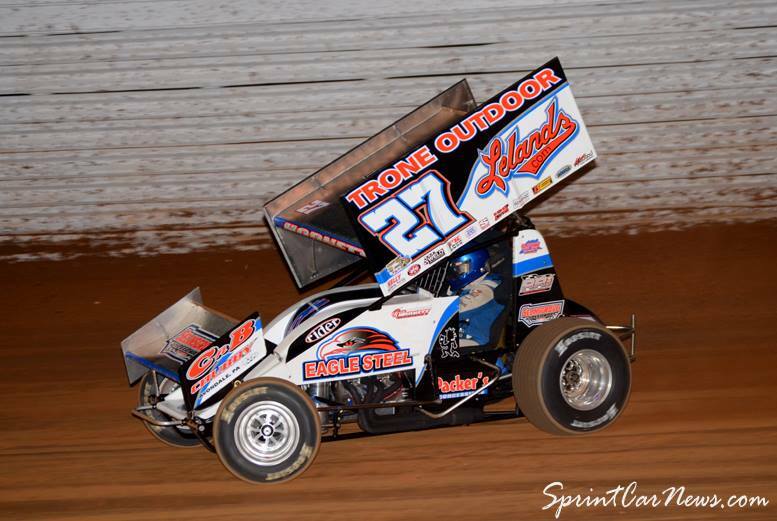 Smith held off a few challenges by Greg Hodnett for the second spot with Hodnett settling for third. Freddie Rahmer and Danny Dietrich rounded out the top five finishers. Sixth through 10th went to Alan Krimes, Lucas Wolfe, Doug Esh, Cory Haas and Aaron Ott. Heats went to Dewease, Wolfe and Ott. Dewease set the fast time with a lap of 16.865 seconds and earned the pole for the main by winning the dash. Eric Parker led from the start of the 20-lap 358 sprint main with Rich Eichelberger chasing him for the win. Parker was stout for the first dozen laps of the race, getting away from the field before beginning to struggle in the corners during the later stages. After starting outside the fifth row, Doug Hammaker moved into fourth with six laps to go before moving by Matt Findlay and Eichelberger for second with four laps to go. Hammaker was running well around the inside of the speedway and used that lane to net the lead and win with three laps to go. Parker held on for a career best Grove finish of second followed by Findlay, Chandler Leiby and Adrian Shaffer. Sixth through 10th went to Eichelberger, Phil Walter, Kevin Nouse, Chad Trout and David Holbrook. Heats went to Parker, Leiby and Nouse with Jared Esh taking the consolation race.